Discussion in 'Com. Reviews' started by Freelance, Apr 25, 2014. No, this review isn't about the PS3 game entitled Tokyo Jungle. This is the PlayStation Mobile game that is only playable on PSM-certified devices (certain phones and the PS Vita), so if you don't have any such device, then you're out of luck. I also want to let you know upfront that I enjoy this game more than Tokyo Jungle. It's more accessible, less frustrating, and goes by at a faster pace. More details will follow. Like its big console cousin, TJM is about one lone animal trying to make its way in the world after humans supposedly abandoned Earth, leaving the city of Tokyo a veritable jungle where only the strong survive. The main object of the game is to simply survive for as long as possible by finding plants (if you're a herbivore) or other animals to chow on (if you're a carnivore). Despite it being a survival game, however, there is no need to drink, pee or sleep to live. Caption: Hmmm, a bunch of sleeping animals. Which one shall I eat? 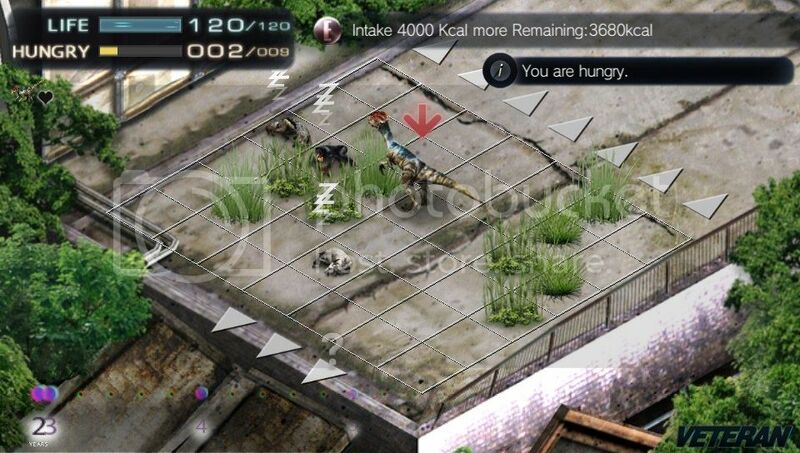 The gameplay is pretty much the same as the PS3 version, but as you can see from the screenshots, it is in an isometric view on a grid and you move one square at a time as you traverse the streets of Tokyo. Please note however that this is not a turn-based game, despite what it looks like. It runs in real time, but on a grid. Aside from no animations, the gameplay is largely the same. You wander around eating, attacking other animals, marking your territory and mating with one of three available females to procure offspring so your species can survive in a harsh environment. The better females (Average and Prime) require you to have a better rank, just like TJ, before they would want to mate with you. It's interesting to note that the Desperate females are the ones initiating the mating, unlike the other two. They must be really desperate, haha. Your offspring, which varies depending on what female you chose to mate with, act as extra lives. If you happen to perish by starvation or death at the hands of a carnivore, you will then play as one of your offspring. If all your offspring perish, then it's game over. The only reason to sleep, other than changing the time, is to attract better females to the area. You don't want Desperates, as they only give you one offspring, and that doesn't help you much at all. The graphics are pretty good. Although they do not move, all the animals and the other stuff like plants and nests, look like they've been simply ripped out from the PS3 version. I can't see any difference between the two versions. Caption: Hubba hubba! A Prime female! Now I will tell you why I prefer this game over the PS3 version. While the game isn't bad at all, it can sometimes be a frustrating exercise. It's the toxicity that usually kills me more than the predators do. It happens way too early and too often, leaving the entire zone contaminated, and if you happen to be nowhere near another area, you're pretty much screwed unless you can find the sewers, which apparently is a place that is safe from it. However, not every animal can fit down there so that's not an option if you're an elephant. In TJM, there is still toxicity, but it normally doesn't appear until much later in years, and because the zones are smaller than on the PS3 version, its easier to get out of. It's something I really appreciate in this game. Yes, the zones are smaller, but that only makes for much faster gameplay, which I like. It's easier to travel through the areas, and the challenges come up one after the other. Yes, they are back, but there is only one at a time. Completing them will gain you better stats so when you mate, your offspring will inherit these extra stats from you. Challenges range from eating a mushroom to defeating 15 animals, so it's always wise to plan ahead on the Start screen map. It's always best to be close to areas with lots of food at all times because several challenges require eating a whole mass of food. 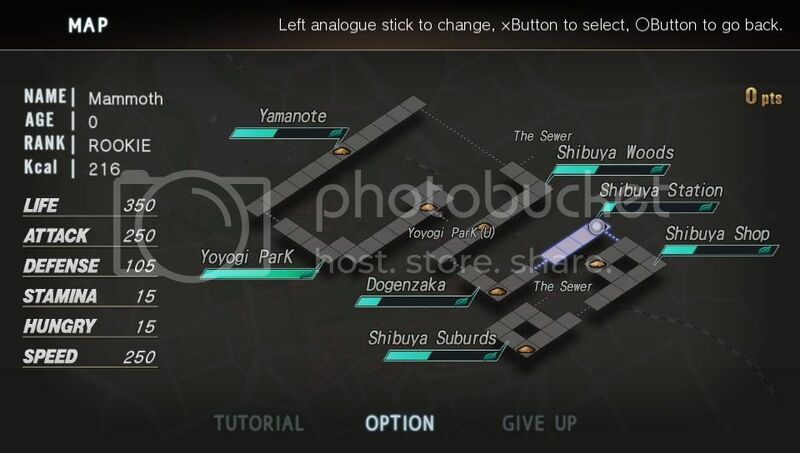 Caption: The map gives valuable info on the various districts you'll be traveling to, as well as the stats of your character. One nice thing about TJM is that every animal from the PS3 version has made its home here, and that includes all the DLC animals too! There's roughly 40, made up of carnivores and herbivores from a cute little rabbit to a big ferocious dilophosaurus. Each animal has varying stats. Some can survive longer before starving. Others can run faster and others may have higher defense. It's not without its tradeoffs though. Dinosaurs are big, fast and tough, but their hunger meter is so low that they must eat constantly (and I mean it) to survive. Elephants may have huge defenses, but they're also very slow, which can be annoying when you're trying to get somewhere fast. In the PS3 version, you are required to complete specific challenges with each animal to unlock a new animal. In TJM however, every animal is available from the start, which is -very- nice. You can pick and choose at your lesiure. All you need is the necessary points to 'buy' them for use. You are not forced to play any critter so you can aways stick with your favourites. Some of my preferred animals are the crocodile and the kangaroo, both of which were DLC on the PS3. I was a tad disappointed when I found out. I bought it after I bought the PSM version, you see. Gone are the accessories you can use to increase your stats, but I always thought real animals looked silly with such things anyway so I don't mind that they're not around. Also gone is the Story mode that told the story of why the humans had left Earth, but the real meat of the game was always Survival, which is the only game mode in TJM. Try to survive to 100 years. It does get a lot harder one the dinosaurs show up and the highest I've ever reached is 64 with the crocodile. TJM may have a grid and a different view from its console version, but the gameplay is exactly the same, which makes it a very good alternative if you're away from your PS3. It has ALL the animals and no DLC which some people would consider a plus. It's fun, faster, and more accessible than TJ, which are good points to have for a mobile game, and all in all, it is a great addition to the PSM line up. There is, however, one con that I just point out right now. Unlike the PS3 version, TJM has NO save feature. You must play until you die (or go into sleep mode) and if you happen to be very good at the game, expect to be staring at the screen for a while. Sorry, I despise scores in reviews. My actual review tells you all you need to know. Herbivores are harder to play as than the carnivores. Animals are literally everywhere. Not so with plants. Jacky, Irishchai, stolenxnametag and 2 others like this. What a review!!! Might have to get this for the Vita when I get a chance. Didn't know there was a different version. Good review. I honestly still have no interest in the game but it's not because of your review, it's because it just doesn't interest me. The review was very detailed and gave me a good idea of the game though. Thanks guys for your kind words. BigPete, it's $5.99 but if you had seen it for a week after launch, it was at a discounted price of $2.99. If you have any questions about the game, feel free to ask. Somehow I got this for free, maybe from Xperia Privilege?? Didn't even know there was a mobile version of TJ. Fantastic review by the way! I will look forward to another one from you, if you decide to keep them coming. My review can't be -that- good. At any rate, I may do another one for my favourite PSM game. Bet you can't guess what it is. My review can't be -that- good. It's objective and gives a great comparison to the PS3 version. It's -that- good! I have to agree - this is an excellent review and I'd enjoy reading more like it. The objectivity is refreshing, with good explanation on your subjective opinions. No score is definitely a plus too. No point in having a number when the bigger picture is described so effectively. Nice review, nice details, but the game still sounds boring to me. I won't be picking up either version. But it's not because ur review but rather the gameplay i've seen on youtube and such made it just appear boring to me. Thanks for the review though and i'm glad you like the game.